Fast casual continues to generate strong appeal with American consumers. That success has been based on the competitive positioning of the segment compared to traditional quick service and casual dining. Patrons continue to trade up from quick service to the made-to-order, fresh quality and contemporary experience, and trade down from the less convenient, higher-priced casual dining segment, especially at lunchtime. But what are the price thresholds for consumers at Fast Casual? A recent survey for Technomic’s Value & Pricing Consumer Trend Report asked consumers to define the price at which a product is too cheap so as to impact quality (low price); the price at which the item is a bargain (optimal price); the price at which a product is starting to become expensive, but they would still purchase it (indifference price); and the price at which a product is so expensive they would no longer purchase it (high price). 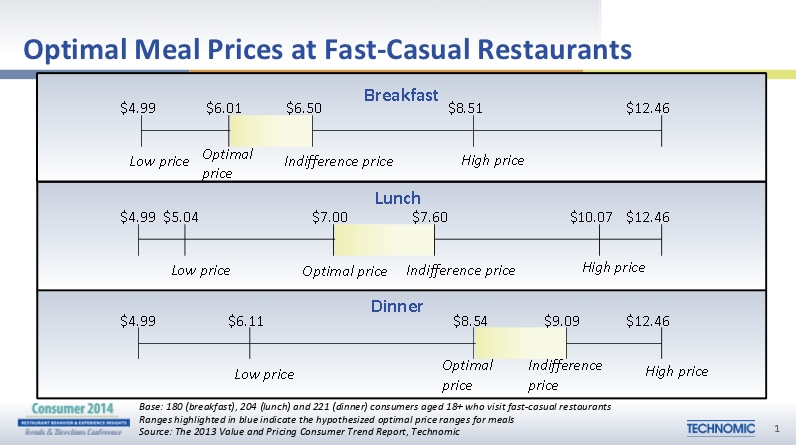 Consumers indicated that at breakfast, the sweet spot between optimal and indifference was $6.01 to $6.50. At lunch, the sweet spot increased to a price point between $7.00 and $7.60, with dinner results from $8.54 to $9.09. Also, some consumers indicated their thresholds for high price were as high as $8.51 for breakfast, $10.07 at lunch and $12.46 for a meal at dinner. This chart provides a strong tool for fast casual operators to review their pricing and see how each of their meal bundles or a la carte items fit within the price points consumers indicated for meals at each daypart. With regards to traditional quick service, the optimal price point for breakfast was $1.50 lower, lunch $2.00 below, and consumers indicated at dinner they would pay $2.50 less than fast casual. Interestingly, fast casual optimal prices increased by 50 cents throughout the day with each daypart. So what does this all mean to operators? Vary portion size and price. Offer opportunities for customers to upgrade to larger portions or reduce spend with smaller plates or samplers. A “one-size-fits-all” approach may not suit differences in demographics between men and women or health vs. indulgent diners. A range of prices from high to low allow diners to spend what they want and get what they are looking for. Promote value through offering full meals. Recent Technomic consumer research indicated that, in general, 80% of consumers purchase value meals at fast food restaurants at least once every two to four weeks. As consumers grow accustomed to purchasing “meals,” fast casual operators should offer meals that simplify the ordering process, increase check average and provide higher value. Provide fresh and premium products. Nearly 48% of consumers polled indicated they would likely purchase and pay more for a food or beverage that is fresh. In addition, 37% say the same for premium food and beverage options. Taking credit for the fresh ingredients and preparation of food and beverages is important in justifying your prices. Menu descriptions, fresh images and interaction with customers build the story and give patrons a connection with a better-for-you offering. Enhance your value positioning with customization. As the consumer’s need for greater control increases, giving them more options for having it their way enhances the value they receive. Providing patrons with the ability to allow ingredient substitutions, vary spiciness, and add more toppings are opportunities to delight the customer, build loyalty and get them back through the door. Overall, operators who are able to provide broad options and keep it simple will win over customers with the right price and the right value. This entry was posted on Tuesday, February 11th, 2014 at 3:54 pm and is filed under Fast Casual, Growth, Price. You can follow any responses to this entry through the RSS 2.0 feed. You can leave a response, or trackback from your own site.